Derek Flaherty BVMS, DVA, DipECVAA, MRCA, FHEA, FRCVS. Derek qualified from Glasgow University in 1988 and then spent 6 years working for the PDSA before returning to Glasgow to undertake a residency in veterinary anaesthesia. He holds both the RCVS Diploma in Veterinary Anaesthesia and the Diploma of the European College of Veterinary Anaesthesia and Analgesia, and is a European and RCVS Recognised Specialist in the subject. He has also gained membership of the Royal College of Anaesthetists, one of only a handful of vets granted this honour. 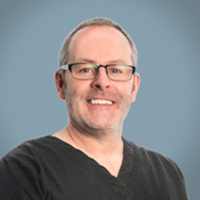 Derek was granted a Personal Professorship in Veterinary Anaesthesia and Analgesia by the University of Glasgow in 2012, and was awarded Fellowship of the Royal College of Veterinary Surgeons in 2017 for Meritorious Contributions to Clinical Practice. Flaherty D. and Auckburally A. Neuromuscular blocking agents. In Dukes-Novakovski T., de Vries M. and Seymour C. (editors) BSAVA Manual of Canine and Feline Anaesthesia and Analgesia 3rd edition (2016) BSAVA Publications, Quedgeley, Chapter 16 pp 214-24. Flaherty D. and Blackwood L. Blood gas analysis and acid-base disorders. In Villiers E. and Ristic J (editors) BSAVA Manual of Canine and Feline Clinical Pathology 3rd edition (2016) BSAVA Publications, Quedgeley, Chapter 9 pp 165-182. Brodbelt D.C., Flaherty D. and Pettifer R.G. Anesthetic Risk and Informed Consent. In Grimm K.A., Lamont L.A., Tranquilli W.J. Greene, S.A. and Robertson S.A. (editors) Lumb and Jones Veterinary Anesthesia 5th edition (2016) Wiley Blackwell, Iowa, Chapter 2 pp 11-22. Flaherty D. Anaesthesia for the critically ill patient. In Bonagura J. (editor) Kirk’s Current Veterinary Therapy XV (2013) Elsevier, Chapter 13 pp 63-70. Flaherty D. Analgesia. In Welsh E. (editor) Anaesthesia for Veterinary Nurses 2nd edition. (2009) Blackwell Science, Chapter 7 pp 162-190. Flaherty D. Anaesthetic drugs. In Welsh E. (editor) Anaesthesia for Veterinary Nurses 2nd edition. (2009) Blackwell Science, Chapter 6 pp 121-161. Flaherty D. and Auckburally A. Muscle relaxants. In Seymour C. and Dukes-Novakovski T. (editors) BSAVA Manual of Canine and Feline Anaesthesia and Analgesia 2nd edition (2007) BSAVA Publications, Quedgeley, Chapter 15 pp 156-165. Flaherty D. and Blackwood L. Acid-base disorders and blood gas analysis. In Blackwood L. and Villiers E (editors) BSAVA Manual of Canine and Feline Clinical Pathology 2nd edition (2005) BSAVA Publications, Quedgeley, Chapter 9 pp 135-148. Flaherty D., Nolan A. and Reid J. Complications during recovery from anaesthesia in the equine patient. Equine Veterinary Education (2005) Manual 7. Flaherty D. Anaesthetic drugs. In Welsh E. (editor) Anaesthesia for Veterinary Nurses. (2003) Blackwell Science, Chapter 6 pp113-156. Flaherty D. and MacGillivray J. Analgesia. In Welsh E. (editor) Anaesthesia for Veterinary Nurses. (2003) Blackwell Science, Chapter 7 pp 157-178. Miller C. and Flaherty D. Anaesthetic-associated cardiac arrhythmias in dogs and cats: part 1. Companion Animal (2017) 22: 504-509. Miller C. and Flaherty D. Anaesthetic-associated cardiac arrhythmias in dogs and cats: part 2. Companion Animal (2017) 22: 640-645. Flaherty D. and Auckburally A. Green discolouration of urine following propofol infusion in a dog. Journal of Small Animal Practice (2017) 58: 536-538. Yamaoka T., Flaherty D., Pawson P., Scott M. and Auckburally A. Comparison of arterial blood pressure measurements obtained invasively or oscillometrically using a Datex S/5 Compact monitor in anaesthetised adult horses. Veterinary Anaesthesia and Analgesia (2017) 44: 492-501. Minghella E., Auckburally A., Pawson P., Scott M.E., Flaherty D. Clinical effects of midazolam or lidocaine co-induction with a propofol target-controlled infusion (TCI) in dogs. Veterinary Anaesthesia and Analgesia (2016) 43: 472-481. Montefiori F., Pawson P., Auckburally A., Scott, M. and Flaherty D. An evaluation of a target-controlled infusion of propofol or propofol–alfentanil admixture for sedation in dogs. Journal of Small Animal Practice (2016) 57: 181-187. Scott, M., Flaherty, D., and Currall, J. (2014) Statistics: general linear models (a flexible approach). Journal of Small Animal Practice, 55: 527-530. Sandercock, D. A., Auckburally, A., Flaherty, D., Sandilands, V., and McKeegan, D. E.F. (2014) Avian reflex and electroencephalogram responses in different states of consciousness. Physiology and Behavior, 133: 252-259. Flaherty, D. (2014) Veterinary analgesia: moving closer to Nirvana? Journal of Small Animal Practice, 55: 291-292. Montefioiri F. and Flaherty D. Non-steroidal anti-inflammatory drugs in veterinary practice, part 1: why they do what they do. Veterinary Nurse (2014) 5: 220-225. Bettschart-Wolfensberger, R., Stauffer, S., Hässig, M., Flaherty, D., and Ringer, S.K. (2013) Racemic ketamine in comparison to S-ketamine in combination with azaperone and butorphanol for castration of pigs. Schweizer Archiv für Tierheilkunde, 155: 669-675. Scott, M., Flaherty, D., and Currall, J. (2013) Statistics: more regression models. Journal of Small Animal Practice, 54: 541-546. Scott, E.M., Flaherty, D., and Currall, J. (2013) Statistics: using regression models. Journal of Small Animal Practice, 54: 285-290. Flaherty, D. (2013) Understanding the mechanisms behind acute pain in dogs and cats. Veterinary Nurse, 4: 82-87. Scott, E.M., Flaherty, D., and Currall, J. (2013) Statistics: are we related? Journal of Small Animal Practice, 54: 124-128. Scott, E.M., Flaherty, D., and Currall, J. (2013) Statistics: dealing with categorical data. Journal of Small Animal Practice, 54: 3-8. Amengual M., Flaherty D., Auckburally A., Bell A. and Pawson P. An evaluation of anaesthetic induction in healthy dogs using rapid intravenous injection of propofol or alfaxalone. Veterinary Anaesthesia and Analgesia (2013) 40: 115-123. Flaherty, D. (2012) Acute pain in small animals: how far have we come and where are we going? Journal of Small Animal Practice, 53: 369-370. Amengual M., Flaherty D., Pawson P. and Auckburally A. Occlusion of the inner limb of a coaxial Bain breathing system. Veterinary Anaesthesia and Analgesia (2012) 37: 317-319. Flaherty D. Client consent for clinical research. Veterinary Anaesthesia and Analgesia (2012) 39: 448. Flaherty D. Alpha-2 adrenoceptor agonists in small animal practice 1. Why they do what they do. In Practice (2012) In Practice 35: 524-530. Flaherty D. Alpha-2 adrenoceptor agonists in small animal practice 2. Optimising clinical use. In Practice (2012) In Practice 35: 565-573. Scott M., Flaherty D. and Currall J. Statistics: more than pictures. Journal of Small Animal Practice (2012) 53: 12-18. Scott M., Flaherty D. and Currall J. Statistics: making sense of what we see. Journal of Small Animal Practice (2011) 52: 560-565. Scott M., Flaherty D. and Currall J. A statistics primer. Journal of Small Animal Practice (2011) 52: 456-458. Flaherty D., Scott M. and Currall J. Do clinicians really need to understand statistics? Journal of Small Animal Practice (2011) 52: 279-280. Auckburally A. and Flaherty D. Supplemental intravenous anaesthesia / analgesia in horses. In Practice (2011) 33: 334-339. Bell A.M., Auckburally A., Pawson P., Scott E.M. and Flaherty D. Two doses of dexmedetomidine in combination with buprenorphine for premedication in dogs; a comparison with acepromazine in combination with buprenorphine. Veterinary Anaesthesia and Analgesia (2011) 38: 15-23. Langton S., Flaherty D. and Auckburally A. A serious breathing system fault identified by capnography. Veterinary Anaesthesia and Analgesia (2010) 37: 581-582. Mair A.R., Pawson P., Courcier E. and Flaherty D. A comparison of the effects of two different doses of ketamine used for co-induction of anaesthesia with a target-controlled infusion of propofol in dogs. Veterinary Anaesthesia and Analgesia (2009) 36: 532-538. Auckburally A. and Flaherty D. Recovery from anaesthesia in horses 2. Avoiding complications. In Practice (2009) 31: 362-369. Auckburally A. and Flaherty D. Recovery from anaesthesia in horses 1. What can go wrong. In Practice (2009) 31: 340-347. Auckburally A., Pawson P. and Flaherty D. A comparison of induction of anaesthesia using a target-controlled infusion device in dogs with propofol or a propofol and alfentanil admixture. Veterinary Anaesthesia and Analgesia (2008) 35: 319-325. Musk G. and Flaherty D. Target-controlled infusion of propofol combined with a variable rate infusion of remifentanil for anaesthesia of a dog with patent ductus arteriosus. Veterinary Anaesthesia and Analgesia (2007) 34: 359-364. Dennis S., Wotton P., Boswood A. and Flaherty D. Comparison of the effects of thiopentone and propofol on the electrocardiogram of dogs. Veterinary Record (2007) 160:681-686. Musk G., Pang D., Beths T. and Flaherty D. Target-controlled infusion of propofol in dogs - evaluation of four targets for induction of anaesthesia. Veterinary Record (2005) 157:766-770. Flaherty D. and Musk G. “Anaesthetic monitoring equipment for small animal practice”. In Practice (2005) 27: 512-521. Holton L., Nolan A., Reid J., Scott E.M. and Flaherty D. Comparison of 3 methods of pain scoring used to assess clinical pain in dogs. Journal of the American Veterinary Medical Association (1998) 212: 61-66. Flaherty D., Nolan A., Reid J. and Monteiro A.M. The pharmacokinetics of ketamine following a continuous infusion during halothane anaesthesia in horses. Journal of Veterinary Anaesthesia (1998) 25: 31-36. Flaherty D., Reid J., Welsh E., Monteiro A.M., Lerche P. and Nolan A. A pharmacodynamic study of propofol or propofol and ketamine infusions in ponies undergoing surgery. Research in Veterinary Science (1997) 62: 179-184. Nolan A., Reid J., Welsh E., Flaherty D., McCormack R. and Monteiro A.M. Concomitant propofol and ketamine infusions in ponies premedicated with detomidine: a pharmacokinetic study. Research in Veterinary Science (1996) 60: 262-266. Flaherty D., Nolan A. and Reid J. Complications during recovery from anaesthesia in the horse. Equine Veterinary Education (1996) 8: 17-22. Thomson R. and Flaherty D. Anaesthetic management of asthmatic cats. Veterinary Times (2017) in press. Flaherty D. Problems associated with anaesthetic breathing systems 1: Generic issues. Veterinary Times (2010) 9: 12-15. Flaherty D. Problems associated with anaesthetic breathing systems 2: Specific system issues. Veterinary Times (2010) 10: 6-8. Flaherty D. Are we overdosing our patients with anaesthetics? A philosophical debate. Veterinary Times (2010) 6: 10-12. Flaherty D. Sedation in cats. Journal of the Feline Advisory Bureau (1994) 30: 81-84.